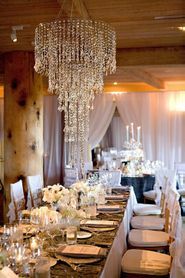 When you have a huge venue and a luxurious budget, large crystal chandeliers are an ingenious way to add elegance and drama that enhances the existing environment. A projected skyline from your favorite international city, complete with Gotham-style spotlights and Broadway-worthy event lighting, sets the stage for the most dramatic reception your guests are likely to experience in this lifetime. 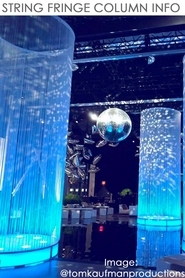 And as an event designer, the value of these extreme chandeliers just keeps on accruing. 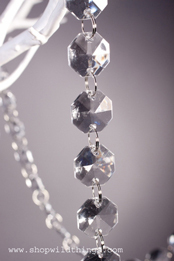 Crystal chandeliers are classic, high quality pieces that will serve as focal points for so many types of events, and they"ll last for years without going out of style. 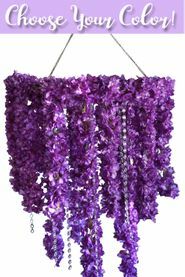 What event designer isn"t looking for reusable, lightweight, versatile pieces that are completely customizable? 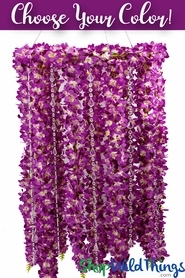 Throw in the fact that they can transform a huge outdoor venue instantly, and you"ll want to add our string curtains to your event design arsenal a.s.a.p. This stunning daytime reception design showcases string curtains as both backdrops and as a faux chandelier. 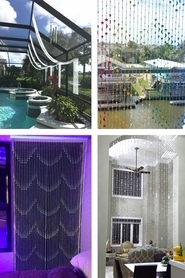 Marking the boundaries of the space without obscuring the attractive natural setting, string curtains are at home at outdoor events of every type. 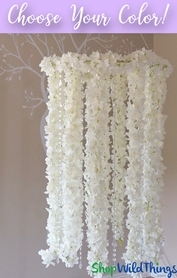 And perhaps best of all, the graceful arced design shown here is created in minutes using only scissors. 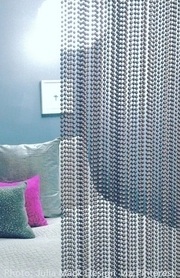 If you"re inspired to add bling or to mix media, consider bead curtains and metal chain curtains, which are also super conducive to applications like this amazing industrial chic design. 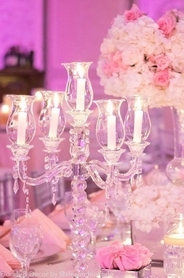 Finally, don"t forget the crystal tabletop candelabras to bring the bling to conversation level, too. 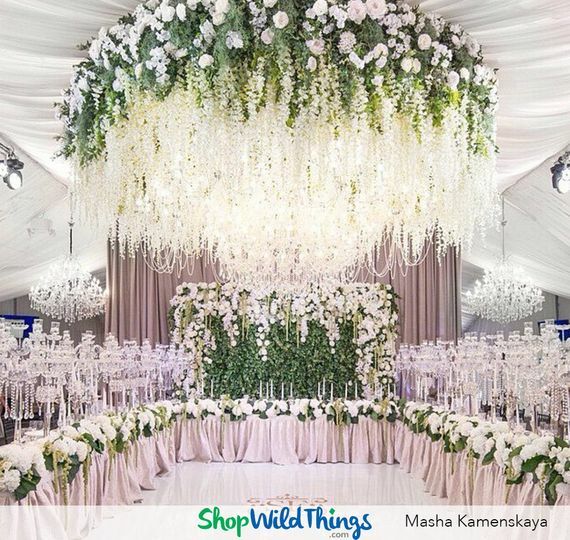 Floral chandeliers are becoming de rigeur at the most luxurious weddings and receptions, and top event designers are always looking for ways to take them to the next level. Enter crystal bead strands with suspended glass candle holders. 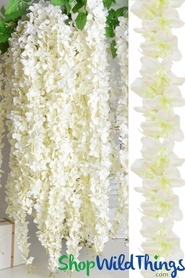 This affordable touch of sparkle and romance completes the floral installation, sending the wow! 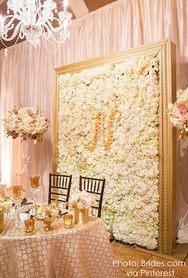 factor through the roof while repeating the strong vertical lines that mark the mirrored ceremony backdrop. A dense web of crystal candelabras, crystal strands, and chandeliers adds visual interest and glittering detail to this fabulous reception. We love the way that the tabletop candelabras blend seamlessly with the low hanging chandeliers, and the draped crystal strands within the floral chandelier complete the stunning effect of top-to-bottom shimmer and sparkle. As you plan for a year of building your business and taking your events to the next level, we would love to consult with you about the best products to maximize your Decor investment and your value to your clients. 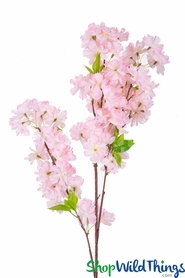 We stock thousands of carefully crafted, ruthlessly tested products that we are proud to offer to the best wedding and event designers in the industry today. Give our customer service representatives a call at 1-928-855-6075, and let us help you choose the best new staple pieces for your style and today"s market. We will get your order packed, shipped, and in your hands in time for you to take your business to new heights in the new year.